Apple MFi Certified Lightning to USB Cable with 8 Pin Chip. Each Apple cable contains a unique, verified serial number and an authorization chip issued by Apple which communicates with any lightning connector device to ensure 100% compatibility. High Speed Sync & Charge Cable with 2.4A max. Support fast charge with max 2.4 amp charging capabilities from the 2.4A output USB port on wall chargers or car chargers. 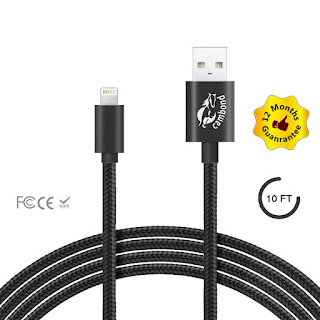 Great length At 10ft (3m), the extra long charging cord length is optimized for use with hard-to-reach USB ports and out-of-sight wall chargers. Extra iPhone Cable Replace your original 3ft Apple cable or add another for your home, workplace, nightstand, car, suitcase or your wife's bag, etc. Compatible with The Cambond® lightning cable works with apple devices that have a lightning port, including the apple iPhone 6s, iPhone 6s plus, iPhone 6, iPhone 6 plus, iPhone 5, iPhone 5c, iPhone 5s, iPad Pro, iPad air, iPad air 2, iPad Mini 4, iPad Mini 3, iPad Mini 2, iPad Mini, iPad 4th generation, iPod 5th generation, and iPod nano 7th generation. Warranty At Cambond® we believe in our products. That's why we back them all with an 12-month warranty and provide friendly, easy-to-reach support.